Those of us who heard William Kapell live on the concert platform will not forget his brooding good looks, his fierce concentration and energy, his command of the instrument, and above all his passionate commitment to the music he was playing and its communication to the audience. He was already a mature artist when he died at the age of 31, in a 1953 airplane crash returning from a concert tour in Australia. But he was still a work in progress, deepening his interpretations while he explored new repertory, and his untimely death deprived us of a major artist who had yet to achieve his full potential. Still, he left behind a considerable recorded legacy, and RCA has now gathered it all together in a remarkable 9-disc tribute to his memory. The set contains everything from his earliest to his last recordings, live and in the studio, including a fascinating 22-minute interview taped shortly before he left for Australia in 1953. 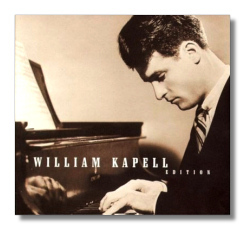 Kapell first became well-known for his spectacular virtuosity in the great Russian showpieces, but soon abandoned them for earlier and later repertory, from Bach and Chopin to Copland and other contemporary composers. They're all here: the meretricious flashiness of the Khachaturian concerto in the most exciting performance it has ever received; sumptuous versions of Rachmaninoff's Rhapsody on a theme of Paganini and Mussorgsky's Pictures at an Exhibition; lots of Chopin (including 29 of the Mazurkas and a wonderfully developed performance of Sonata 3); a shapely and well-conceived Beethoven Piano Concerto #2; several short Schubert pieces and some very exciting Liszt; the spare chordal sonorities of the Copland piano sonata; and much more besides. Even his skill as a chamber musician is made evident in Rachmaninoff and Brahms sonatas, where his work is not over-shadowed by that of great artists like William Primrose and Jascha Heifetz. Kapell was often compared to Horowitz, whom he greatly admired, and Schnabel (whom he adored) once mistook one of his recordings for his own, but oddly, his musical objectivity and the often rather bleached quality of his tone puts me most in mind of Glenn Gould. His interpretations, though highly individual, never depart from the score as much as many of Gould's, but there is a similarly crystalline purity in his playing. At the same time, his temperament was essentially romantic and it shows, in his use of rubato and dynamic and rhythmic contrasts. Put it all together and what you've got in this set is 10 hours of a truly great musician playing some great music, and no connoisseur of the piano should miss it.